These Table Skirts with Stretch Design Fit Over the Supplied Countertops! Transform Basic Banquet Furniture into an Eye-Catching Presentation with Tablecloths! Host Your Next Formal Gathering with the Help of These Table Skirts! 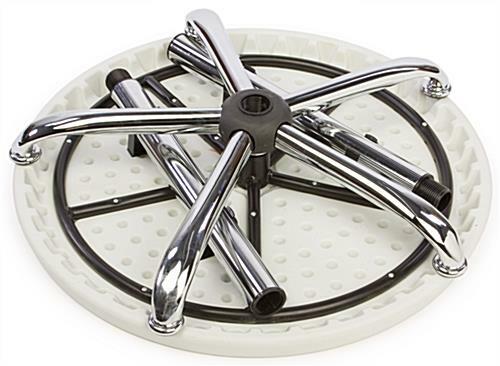 Knockdown portable tables are great for travel. 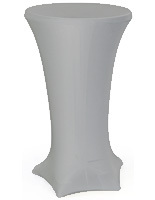 Pedestal design accommodates a small circle of guests during a cocktail hour or tradeshow. 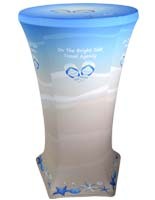 Wrinkle-free display creates smooth forms, while keeping the tables functional. Packaged deal makes shopping simple; Tablecloth is guaranteed to fit. 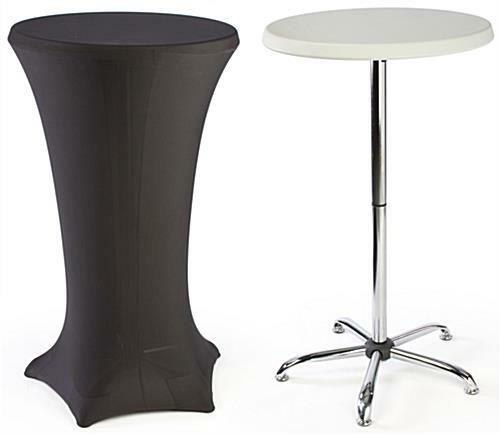 These cocktail tables are sold with black spandex table skirts to dress up a room with contemporary style. 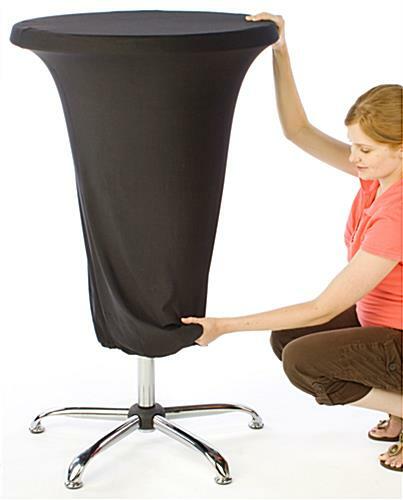 The stretch fabric tablecloths are easy to set up and do not require pins or clips for attachment. These tall cocktail tables with table skirts, also known as pedestal highboys, measure 47"h and feature a 27"w countertop. 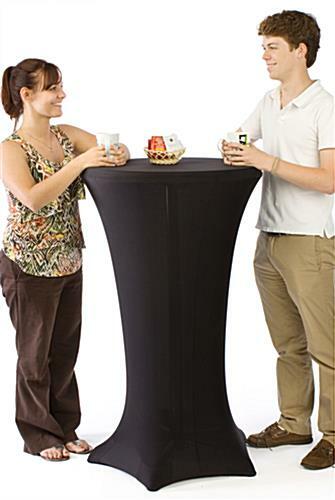 The furniture is therefore the ideal height for guests at a wedding or a trade show to stand around and schmooze. The high-top cocktail tables are equipped with form-fitting table skirts. The black tablecloths have a pillowcase-like structure and will easily slip over the top of the furniture. Five reinforced corners are spread out along the bottom for each foot of the base to press against. 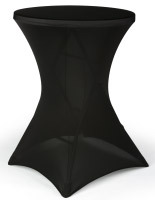 These cocktail tables that include spandex table skirts have modern styling, especially when the skirting is in place. The form-fitting fabric is pulled taut, thus eliminating wrinkles while still providing a flat countertop surface for displaying snacks or samples. 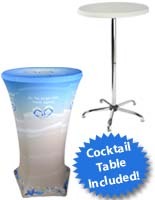 The cocktail tables and table skirts that completely disassemble are therefore perfect for those traveling to and from an event. The furniture ships unassembled to save on shipping costs; however, the units are easy to put together. 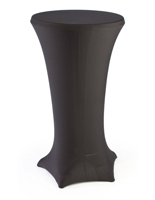 These cocktail tables that are meant for standing guests are made up of a round HDPE plastic counter and a sturdy steel pedestal. 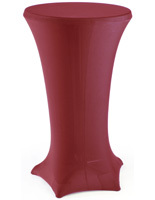 The fanned legs provide a stable base that won't rock or sway. The black spandex table skirts look great when used to highlight a specific section of a room.